“Monk Who Drinks Coffee” by Banu Ganitri Khan presents the reader with a small collection of her spiritual experiences, written in a simple and very sincere way. Her short stories are profound thoughts and feelings coming from her deep meditations on common everyday life; situations that you may feel familiar with in which you will probably find guidance. ‘Good’ has a meaning with ‘bad’. ‘Happy’ has a meaning with ‘sad’. ’Love’ has a meaning with ‘hate’. You play which channel they like. It is incredible how, in so many occasions, we lose focus on certain things and just center on others, that at the end it is not what we really were looking for. “We are all partially blinded by desires.” It is so true. The way Khan relays her experiences with the spiritual world and religion is very unique, how she says that our God or our Creator “loves variety.” At the end of her message, we know we have always the choice in our hands for any decision or path we choose in our life. How by choice, we can be a better human being and take care of the treasures that we are given and do our best to make our journey enjoyable. 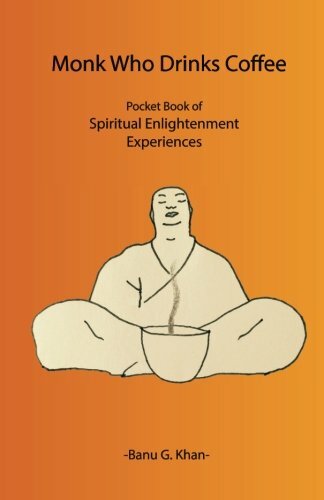 "Monk Who Drinks Coffee" by Banu Ganitri Khan is a book of truly simple experiences that will enlighten you spiritually. Great book.